Pocketmint now spans three and a half years, and while there are certain posts I would write the same today, other things in my life have changed over that time. I think this personal evolution is often meaningful, so periodically I’ll be highlighting something I said in the past and updating it with my current perspective. And then there’s the chapter on the dangers of cheap food. I gave up meat twenty years ago, so the description of what the pork industry calls “PSE” (for “pale soft exudative”) left me shuddering but secure in my moral stance. 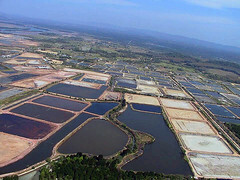 Unfortunately for me, however, most of the chapter is devoted to the environmental deterioration and human degradation resulting from the explosion of Asian shrimp farms. Shrimp is a significant component of my diet, in part precisely because it’s become so cheap. This presents a dilemma I have yet to resolve. My track record is not perfect; on a few occasions in the past two years I’ve indulged in restaurant shrimp which (in the absence of assurances to the contrary) I assume was foreign-farmed. Still, I estimate that’s roughly fifty pounds of environmentally-damaging shrimp I have not purchased so far. Unfortunately from a frugality standpoint, wild-caught shrimp is considerably more expensive than farmed shrimp shipped in from Vietnam, Thailand, or Ecuador. Like more than double. Imported farmed shell-on shrimp is commonly $5.99 a pound from Costco or a grocery sale. 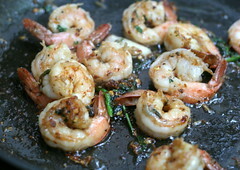 Comparable U.S. wild shrimp, on the other hand, is usually between $12.99 and $15.99 a pound. 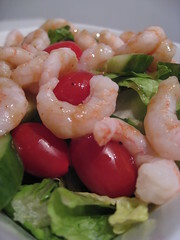 Substitute Oregon shrimpmeat. For West Coast folks this is a winner, being both cheap and relatively local. Rated as a ‘best choice’ by Seafood Watch, Pink Shrimp — sold here as ‘wild Oregon shrimpmeat’ — are a small coldwater species. You might think of them as ‘bay shrimp’ or ‘salad shrimp’; they’re sold preshelled and precooked. Regular price is $5.99 or $6.99, but they are on sale somewhere at least once a month for $4.99, and often available fresh during the late-summer season for just $3.99 a pound. The flavor is vastly superior to farmed prawns, especially when fresh, and I don’t have to spend half an hour shelling them. I use Oregon shrimpmeat in shrimp tacos, shrimp enchiladas, shrimp étouffée, corn and shrimp chowder, shrimp-stuffed mushrooms, and avocado-shrimp salad, just to name a few of my family’s favorites. Watch for sales on wild shrimp and stock up. Three or four times a year, a grocery will put U.S. wild-caught shrimp from the Gulf of Mexico on sale for $9.99 a pound. These are much larger than their Pacific cousins, usually between 15 and 30 shrimp per pound. Every time this happens, I buy two or three pounds of still-frozen shrimp (separated into one-pound portions), and keep them in the deep freeze for the rare garlicky treat. Eat expensive shrimp less often. And by rare I do mean rare. Instead of serving large shrimp three or four times a month, I serve it perhaps once every two months. This has not been as much of a hardship as I would have imagined, in part because of the many dishes which I can make with the cheaper baby shrimp, but also because I’ve developed increased appreciation for purely vegetarian meals. Control portions. Though a vital step, this has actually been the most difficult part, because the culture of our home dinners has always been ‘eat as much as you want’. The problem is that for something as yummy as gambas al ajillo (garlic shrimp) we would go through a half-pound or more per person in a single sitting. That’s $20 for just one meal, before counting any of the other ingredients! So I started setting limits on expensive items. I now allot a quarter-pound of large shrimp per person per meal. No one goes hungry; they are welcome to have seconds of rice, veggies, or whatever else is served. This line met with some resistance — Claire pouted, Jak groused — but I secretly think we all wind up appreciating it more because of the scarcity.